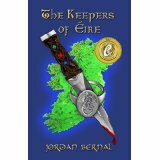 The Keepers of Eire is a dragon fantasy set in present day. Bernal’s book won the 2014 Global EBook Gold Award.She conducted research in Ireland and Scotland for this first in a series novel and soon after it was published, she returned to the British Isles to do research for the second book. The main characters, the dragons, and the dragon riders hold readers’ interest to not only find out what happens to the clan but how the murders will be stopped. The book is available on Amazon in print or on Kindle. My next post will be an interview with Jordan Bernal.